The day has finally arrived. I've been waiting for it for a long time. 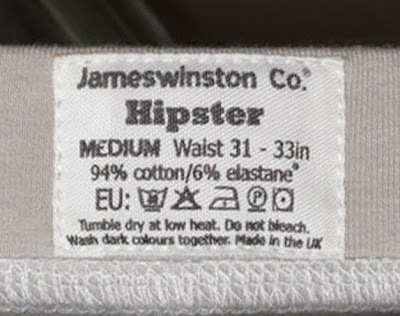 Brian James, co-founder of Jameswinston, has been giving me lots of inside information on the new Jameswinston Co. line for quite a while now, and finally I can share it with you. I am just bursting with excitement to share some of the news from them. I will be continually updating you for the next few weeks up until the final launch. Hopefully my samples will arrive soon and I will be able to share an advanced review with you. The UK based underwear brand has done it again. You may remember that their 'Retro Trunk' range got a perfect score on my review. But somehow they have found a way to improve on perfect. They have decided to step their line up a notch by using lots of fun new colors and styling as well as a fun advertising campaign to get everyone in the world wearing their new line. And trust me, if you haven't tried their skivvies yet you are missing out. More text after photo. 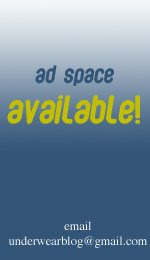 The advertising campaign is fun and funky and includes human modeling of the underwear, as I was hinting at in this post. They have lots of fun new colors and they have added contrast-stitching to the design to add to the overall retro appeal. The new 'Retro' range also includes a new 'ProFIL Pane;' (pronounced Profile). This is a double-layered, specially cut, front panel that accentuates your "crown jewels" without using any tricky string gimmicks or cloth attachments. It truly is "natural" shape enhancement. The wearer simply adjusts to achieve the maximum asset projection and the cut of the panel does the rest. More text after photo. There are even more new lines being introduced as well. They are: The 'Retro Hipster' and 'NEON'. The retro hipster is just a low-rise version of the 'Retro'. And the 'NEON' is a tight fitting, hipster/brief hybrid in fluorescent colors. It even has metallic looking cloth labels. This is being billed as "club" underwear because it can be worn to the club and it will keep you dry and comfortable. I'm really just loving the way this whole range looks. I can't wait for the whole line to be available. The 'Retro' is going to be sold for £13 and the 'Hipster' and 'NEON' will be sold for £11 a piece. I truly cannot fully express how happy I am to finally be able to make this announcement to you. 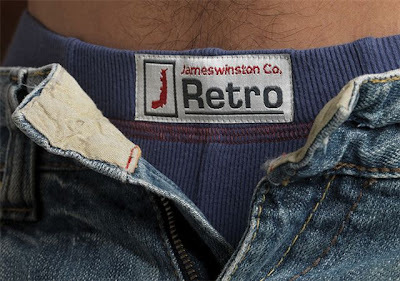 The quality and style in Jameswinston Co. underwear is truly going to change the way people think about underwear. Not only can you have quality, but you can also have a universal stylishness that appeals to everyone. If you are really loving all the graphics in this post and you want to see more, check out the brand new gallery of preview photos. End of entry, no more text after photo.